The 2013 MLB season will get underway Sunday, March 31st in Houston, Texas. As players begin gearing up for the new season in Spring Training, fantasy baseball 2013 drafts around the world are already taking place. There are plenty of old faces in new places in 2013. There are also some quirks to this year’s schedule that could alter your plans on draft day. There is much debate across the baseball landscape as to which position player should be taken off the board in 2013 Fantasy Baseball drafts. Sabermetricians nearly unanimously agree that Los Angeles Angels outfielder Mike Trout should be the first offensive player selected. Trout burst on to the scene as a rookie in 2012, batting .326 with 30 home runs and 83 RBI. Trout, who will be turning only 22 during the 2013 campaign, also scored 129 runs and stolen 49 bases. Trout figures to be at the top of a lineup that features newly-acquired outfielder Josh Hamilton, who is ranked in the top 15 of the vast majority of rankings. Angels first baseman Albert Pujols will also be looking to build off of his 30-homer, 105-RBI campaign. The two other position players at the top of most ranking lists are Detroit Tigers third baseman Miguel Cabrera and Milwaukee Brewers outfielder Ryan Braun. Last year, Cabrera became the first player since 1967 to win Triple Crown honors after batting .330 with 44 homers and 139 RBI. Braun hit .319 with 41 homers and 112 RBI last season, but has once again been embroiled in performance-enhancing drug controversy during the offseason. When it comes to selecting a starting pitcher near the top of your 2013 Fantasy Baseball draft, the two candidates at the top of nearly every list are Justin Verlander of the Detroit Tigers and Clayton Kershaw of the Los Angeles Dodgers. Verlander went 17-8 with 239 strikeouts and a 2.64 ERA en route to leading the Tigers to the World Series last year. Kershaw was 14-9 with 229 strikeouts and a 2.53 ERA. Other starting pitchers at the top of the rankings include Seattle’s Felix Hernandez, Tampa Bay’s David Price and Washington’s Stephen Strasburg. When it comes to relievers and closers, no one heads into the season more valued than Craig Kimbrel of the Atlanta Braves. Kimbrel struck out 116 batters and notched 42 saves in 2012. The 24-year-old Kimbrel has racked up 283 K’s and 89 saves in his first three big league season. Other projected top relievers in 2013 include Cincinnati’s Aroldis Chapman, Philadelphia’s Jonathan Papelbon and Jason Motte of the St. Louis Cardinals. There are some important things to keep in mind before making your first selection in your 2013 fantasy baseball draft. Depending on when your draft is, you may be selecting players who are participating in the World Baseball Classic this year. The WBC runs from March 2nd-19th and will be over long before the season begins, but keeping an eye on those playing in the international tournament certainly is encouraged. In addition, the schedule for every team has been altered this season to accommodate the Houston Astros’ move from the National League to the American League. Every team will now play a total of 20 Interleague games throughout the season. Note: Previous team is in parentheses. 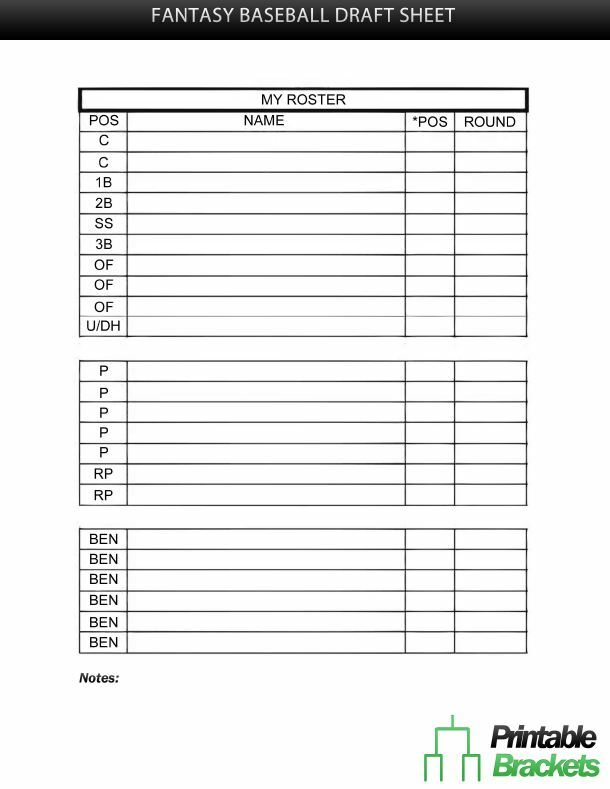 To help you get ready for the upcoming season, a complimentary fantasy baseball 2013 draft sheet is available below. These sheets are printable and perfect for your live or mock draft.